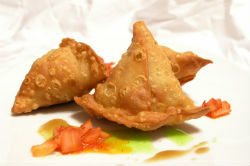 At Red Pepper Indian Cuisine we serve up a fresh traditional Indian cuisine. Choose from our selections of Vegetarian & Non Vegetarian dishes, curries and much, much more!!! Or if you can't make it to us - no problem -we'll come to you! Click on the Order Online tab above and we'll delivery right to your home or office. And be sure to make use of our advance order feature to ensure that your food is delivered exactly when you want it.